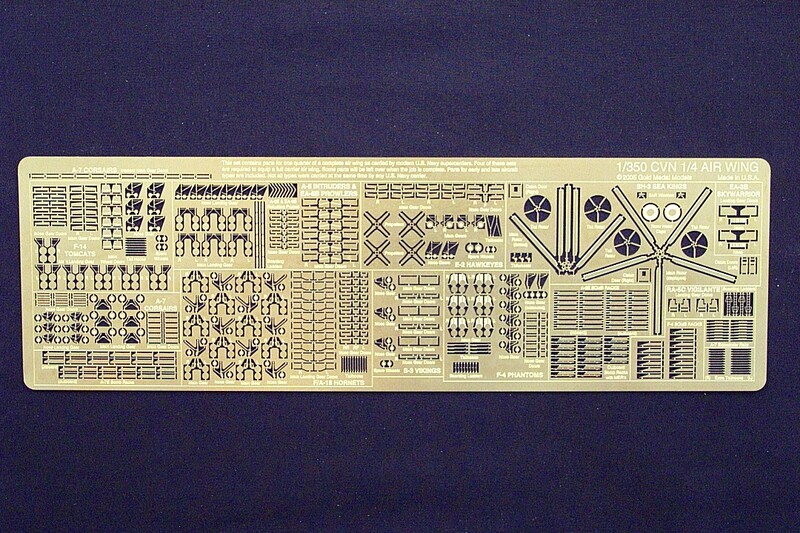 This set will equip any of the aircraft for Tamiya's 1/350 scale USS Enterprise (CVN-65) and Trumpeter's 1/350 scale Nimitz-class aircraft carrier kits. It is intended to equip one fourth of a full air wing with a few parts left over. Four of these sets will be required if a modeler wishes to replicate a full air wing. Three sets will fill the flight deck and leave a few planes left for the hangar. Two sets will give a flight deck a busy look and leave one or two planes for the hangar, a good choice for budget-minded modelers. One set will equip all the aircraft included in Trumpeter's Nimitz kit with some parts left over. This is still a fairly large set and will equip the following aircraft: Six (6) F-14 Tomcats; Six (6) A-6 Intruders and/or EA-6B Prowlers; six (6) A-7 Corsair II's; ten (10) F/A-18 Hornets; six (6) F-4 Phantoms; Three (3) S-3 Vikings; Two (2) E-2 Hawkeyes; Two (2) SH-3 Sea Kings; Two (2) RA-5C Vigilantes; and Two (2) EA-3B Skywarriors. Total number of aircraft of all types: forty-five (45.) Not all types will be used at one time on one ship. Extra parts are provided in the event of loss or damage. In addition, 86 underwing bomb racks in six styles for several aircraft and 14 Sidewinder missile racks for A-7 Corsairs are supplied. Tailhooks for several aircraft are furnished (some models of aircraft don't need them because their hooks are completely concealed when not in use) and boarding ladders for A-6, EA-6B, and F-4 aircraft are also included as well as four non-aircraft-specific boarding ladders. Also furnished are six (6) refueling probes for A-6 and EA-6B aircraft. Cabin doors and SAR winches are supplied for the SH-3 Sea Kings. Extended nose gear struts for F-4 Phantoms are also furnished for aircraft about to be catapulted. Extensive relief etching is employed for added detail on wheels, rotors, and numerous other parts. SEE PHOTOS AND A REVIEW OF GMM'S 1/350 CVN 1/4 AIR WING DETAIL SET!